I (jim) am writing a novel that came to me after playing a gig in NYC 6 years ago. Josh and I stayed in the city for a couple of days and came back on a megabus. I was looking out the window into the passing cars and noticed that everyone in the cars were texting. I immediately got this massive inspiration for a story set in the latter quarter of this century where people text mind to mind. I thought it was a short story, but it's growing into a novel, maybe a few novels. 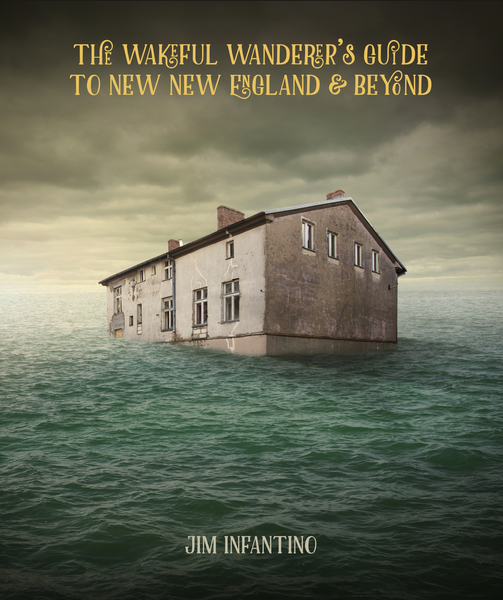 The working title is The Wakeful Wanderer's Guide to New New England and Beyond. I've redesigned my website http://jiminfantino.com to post information about the book. If you want to stay up to date, sign up on my mailing list at the bottom of the homepage and I will start sending out notifications when stuff happens with the book. You can read some chapters here: http://jiminfantino.com/product/book/ and also on wattpad, if you are into wattpad. If you want to support me while I write (as of this newsletter, I'm up to chapter 20) and if you want to read the first draft chapters as I write them, you can support me at https://patreon.com/jiminfantino for as little as $1 a chapter. If you do, please send me comments as you read. They are INVALUABLE. I have a few supporters up there and their feedback is what keeps me writing. This is the last time I will make an announcement about the book in this newsletter as it should be about music only. Please sign up at my personal website above if you want to get updates. Thanks, and I hope to see you in Billerica! Reserve! Resist!